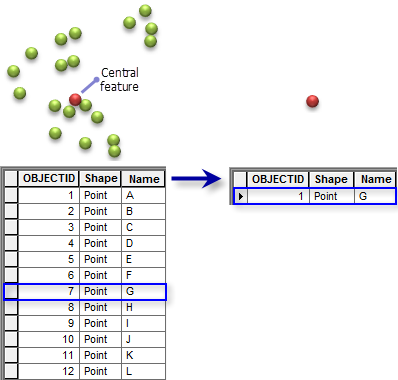 The Central Feature tool identifies the most centrally located feature in a point, line, or polygon input feature class. Distances from each feature centroid to every other feature centroid in the dataset are calculated and summed. Then the feature associated with the shortest accumulative distance to all other features (weighted if a weight is specified) is selected and copied to a newly created output feature class. The Central Feature tool creates a new feature class containing the most centrally located feature. For example, the following illustration identifies the most centrally located distribution warehouse. All the points below are warehouses, but the red point is most central. The output feature class for this analysis would contain one extracted record: the warehouse that is most central. When a value for Case Field is specified, the output feature class contains a feature for each case. Each record in the output feature class is a copy of the features found to be most central in the input feature class. If you wanted to build a performing arts center, for example, you could calculate the central feature for a block group feature class, weighted by population, to identify which part of town is most accessible and make that census block a top candidate. The Central Feature tool is useful for finding the center when you want to minimize distance (Euclidean or Manhattan distance) for all features to the center.